A scathing critique on the traditionally rosy picture of Canada’s involvement in foreign lands, Paved with Good Intentions aims to expose the imperialistic imperatives behind Canada’s most idealistic organizations. Ostensibly, the Non-Governmental Organization is an institution at arm’s length from the government that can devote itself to benevolent aims, like helping rebuild a ravaged Haiti or bringing healthcare to communities in Africa. Declared as being “as Canadian as hockey” by a Parliamentary report in 1988, the traditional view is that these groups are non-partisan creations driven purely by altruism. Not so, says writers Barry-Shaw and Oja Jay, who claim that for decades NGOs have been driven to conform with governmental policy in order to secure funding and prestige. Even worse, they lay out plenty of research that suggests NGOs are purposely capitalizing on the disasters and poverty of third world countries. Meticulously researched, Paved deserves to be a controversial book, widely read and even more widely discussed. It’s worth slogging through the dry tone: buried beneath the barrage of footnotes and acronyms are plenty of human tragedies, many of which have not been mitigated by Canada’s NGOs. It’s a sobering book that is passionate in its denouncement of the way the Canadian government has manipulated NGOs to serve as a form of cultural imperialism. Barry-Shaw and Oja Jay’s research reveals several shadowy appearances by NGOs in such disparate events as the Haitian coup of 2004, Israeli-Palestinian peace talks and the Afghanistan War. 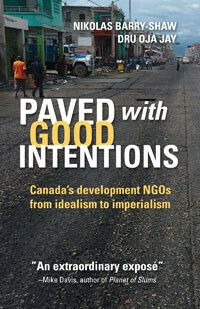 Published by Fernwood Publishing, Paved with Good Intention will be launched in Montreal at Café Artère on April 10, followed by a discussion with the authors. Located in Parc-Ex, Café Artère is a non-profit collective that provides both a café and a conscience, offering an organic menu, performance space and lending library for artists, students and the self-employed. Paved with Good Intentions: NGOs from Idealism to Imperialism by Nikolas Barry Shaw and Dru Oja Jay launches at Café Artère (7000 du Parc Ave., Parc Metro) on Tuesday, April 10 at 6:00 p.m. For more information visit www.artere.coop.